ChemDiv introduces the concept of Targeted Diversity which is intended for the design of high quality libraries of drug-like compounds that have been focused against various biological targets. Targeted diversity signifies the superposition of highly diverse chemical space on the assortment of divergent families or sub-families of targets and unique biomolecules. Distinct, structurally unrelated branches of the same target class. The different classes of biomolecules are represented by G-protein coupled receptors (GPCR), nuclear hormone receptors (NHR), ligand- and voltage-gated ion channels (LGICh and VGICh), transporters (TR), various enzymes (kinases, proteases, phosphodiesterases, etc. ), effector proteins and others. Examples of the branches of related proteins include serine/threonine protein kinases (STPK) and tyrosine kinases (TK) as sub-families of the kinome. An example of independent targets is GPCR-like Smo receptors. 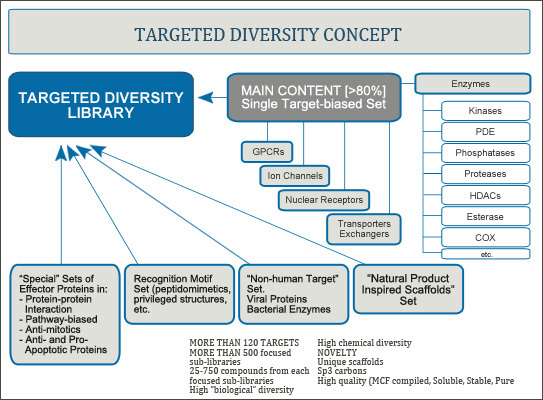 The current edition of the Targeted Diversity Library (TDL) is based on approximately 100 small molecule sets. Each of these sets is focused against distinct biological targets belonging to the different classes and sub-families of targets (list of targets selected is shown below) and includes about 5000 individual drug-like molecules. The selection process for these sets involves identifying active ligands/inhibitors as prototypes existing in the patent and research literature or databases and performing bioisosteric replacement strategies, e.g. a known peptide ligand may be substituted with a small non-peptide peptidomimetic. Then a similarity search based on these strategies is conducted within ChemDiv’s collection for possible augmentation of the rational set. Other techniques include computer-assisted 3-D pharmacophore matching and when possible, in silico docking experiments. The directed synthesis of new chemotypes with functionality mimicking recognition elements (shapes, “warheads”) of known active ligands/inhibitors has also been performed. In some cases, proof of concept has been established with in-house biological data. A special effort has been made to select respective compounds and synthetic templates with good IP potential, as deduced from Beilstein, SciFinder and Markush sub-structure searches. The special rules of ChemDiv’s medchem filters (MCF) ensure the high quality and drug-like properties of selected molecules. The first edition of the TDL includes the most diverse compounds (250-750 members) from each of 100 target-specific sets. The current TDL is built around 1,000 diverse chemical templates to yield a library of about 50,000 individual drug-like molecules. Regular updates are being made as newly synthesized compounds become available and pass our QA specifications (>90% purity as established by LC/MS with UV and ELSD). Additionally, new proposals for target-specific sets are being evaluated, tested and made available. Thus, the TDL may provide high-quality hits in screening against “difficult” targets with limited or no structure/ligand information, as well as “eclectic” biological targets, including cellular processes (e.g. apoptosis and cell cycle), signaling pathways (e.g. WNT, Hh, RTK and Ras) or protein-protein interactions (e.g. XIAP, pGPCRs).